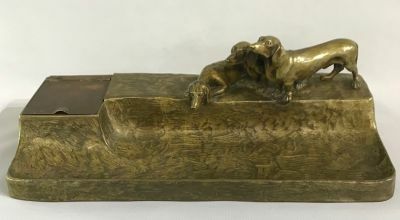 Bronze inkwell/pen tray of three Dachshunds. The sculptor, Friedrich Gornik, Austrian (1877-1943) was prolific circa 1895-1925. AR is the foundry mark for Arthur Rubinstein/Aust-Reich Foundry. 12 3/4” by 5 1/4”, 4 1/2” high.